In the final quarter of 2012, Apple and Samsung were pretty much level as far as computer, tablet and phone market share was concerned. Of all the computers, laptops, smartphones and tablets (or, as IDC calls them, smart connected devices) that were shipped in the last quarter of 2012, Apple accounted for 20.3 per cent - just under one per cent behind Samsung's 21.2 per cent. Shipping devices isn't exactly the same thing as actually selling them though - it just means that the manufacturers got the products to the companies that would then sell them to the man on the street. It's a significant improvement for Apple and IDC reckons this is down to the double-whammy effect of the iPad mini and iPhone 5, both of which were released in October 2012. 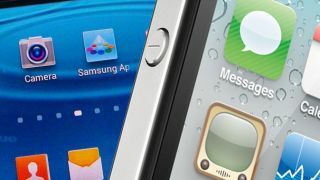 Samsung's only significant release in that timeframe was the Galaxy Note 2 - but with the Galaxy S4 on its way in April, there's a chance that the gap will widen out again before the iPhone 5S hits later this year. In general, there were more shipments of 'smart connected devices' in 2012 than ever before - up 29.1 per cent compared to the previous year. The growth is mainly down to the popularity of tablets as the big tech firms shifted 78 per cent more tablets in 2012 than in 2011. The analysts at IDC don't see the rise of the tablet slowing; the company says that tablets will surpass the ailing desktop PC this year, and even overtake laptops in 2014.